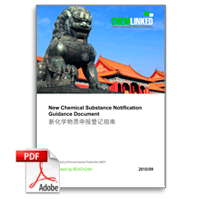 On 8 Mar 2016, the Ministry of Environmental Protection of China notified the Committee on Technical Barriers to Trade under World Trade Organization (WTO) a draft guidance on China new chemical notification (G/TBT/N/CHN/1170). According to the WTO notification, the Guidance is proposed to enter into force on 1 Nov 2016. Compared to the previous draft issued on 25 Jun 2015 (e-translation available on e-book store), updates have been highlighted in yellow in this translation. The revision draft contains 6 Chapters and 5 Annexes.